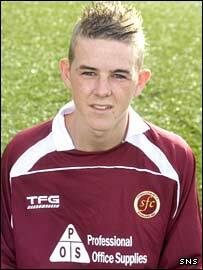 Hearts have signed Stenhousemuir striker David Templeton for £30,000. The 18-year-old Scotland youth international is expected to begin his career at Tynecastle as a member of the under-19 squad. Templeton told Hearts' website: "The move to full-time football will help me develop my game and will also allow me to build myself up physically." Stenhousemuir manager Campbell Money said Templeton has "good pace, two good feet and he scores goals". Templeton said: "Hearts is a big club and I'm looking forward to joining the Jambos. "I learnt about the potential move on Saturday, but I was obviously familiar with the club and its training facilities." Money, the former St Mirren goalkeeper, added: "He is a good type of boy, he will potentially grow into a very good striker." Hearts have been the most active Scottish Premier League side in the January transfer window, bringing in two strikers and two goalkeepers. Templeton has been joined at Tynecastle by Polish frontman Arkadiusz Klimek, who moved from FBK Kaunas. Lithuania goalkeeper Eduardas Kurskis also arrived from Kaunas, while keeper Arnas Lekevicius signed a five-year deal after arriving from the Lithuanian side FK Atlantas. Kaunas defender Mindaugas Baguzis has also arrived at Tynecastle for a week-long trial. Meanwhile, Money signed two players from previous club Cumnock Juniors. Veteran defender Darren Henderson has signed for Stenny until the end of the season and striker John Dempster until May 2008. But goalkeeper Andy Carlin left Stenhousemuir for Bathgate Thistle after asking for a transfer.